Yesterday toward the end of class I looked out the window. I do this a lot, but what was strange about this day was the Chinese girl standing about 6” from the window staring in at us. That wasn't too strange of itself, since we are foreigners and get plenty of stares. But ten minutes later when she was still standing staring at us, that was pretty weird. Our teacher saw her staring in the window and looked surprised but she kept on teaching. I kept giving her weird, “Why are you still staring at us?” looks. Usually after a few of these looks people will get embarrassed and move away, but this girl continued to stare with an impassive face. When class ended the teacher whispered as I walked by, “Why was she staring? That was very strange.” I said we are foreigners so a lot of people want to look at us, but yes, that was strange. As I walked out of the building the girl was loitering by the door. The building manager (man who lives in the building, keeps an eye on things, and keeps it in good shape) was talking to her unhappily, I gather telling her to go away. The building man then came over to talk to one of the teachers nearby, my past writing teacher Li Laoshi. He something about how this girl kept hanging around and he didn't know why. When I walked outside to get my bike, the girl stood by the doorway staring at me. Li Laoshi came out and sternly asked her, “Are you looking for someone?” The girl didn't answer, just kept standing there. Getting more stern, Li Laoshi said, “If you aren't looking for someone then you need to leave!” The girl didn't respond, just kept standing there. I like Li Laoshi a lot, but when she gets stern, most people listen. As I prepared to head off on my bike, the girl turned to me and finally asked, “Where are you from?” I told her America and then biked away. I'm used to staring, and I'm used to people asking where I'm from, but it was all still very strange. I couldn't decide if she was either not quite right in the head or if she was just a very simple country girl with no social graces and a large foreigner curiosity. Two years ago when I first held you I thought you were beautiful, but I didn't yet know what you'd become. I suppose at two you are still in the process of becoming :), but already you have such a strong personality. I love your enthusiasm toward life, the way you approach each day and each event of the day with eager expectation. I love your giggles and smiles and silly faces. Now that you are speaking, I love your 2 year old jokes you tell with a glimmer in your eye. Even before you could speak, you always found a way to express yourself. Daddy, looking at picture of a horse: It's a horse. Juliana: Actually it's a cow. Juliana, holding mama's cup: Baby's cup. Not for mama. Many people who see you say you are such a happy baby, and do you ever cry? Of course sometimes you cry, like when you really want a cracker or really don't want to sleep. When you do, you cry with gusto. You know exactly what you want and make sure everyone else knows too. Perhaps in the future the years will all blend together, so I want to remember and want you to know what your life was like as you began your second year. Daily schedule: Wake up about 6am, whether the sun is up or not. Want breakfast right away, then play with your toys, play under mama's feet, or go outside for a walk in the morning. You love to go outside where everyone knows 安安! You take a 1-1.5 hour nap just after lunch, and in the afternoon 李阿姨 （Li Ayi） comes to play with you. When the weather is good she takes you outside for a couple of hours. We eat dinner around 6:30pm and then play together for a bit before bedtime. Before bed you usually take a bath (every few days), put on jammies, read some stories, nurse, and then (your new habit) fall asleep with your hand on your waterbottle, hopefully to sleep until morning. Sleeping: You have finally gotten down falling asleep on your own and sleeping through the night, except that everytime we travel you are disturbed by new places, wake up all night, and spend half the night in mama and daddy's bed kicking like crazy. Eating: The picky stage continues. You have expanded your diet soemwhat but are rather unpredictable. Your favorite foods are cheese, yogurt, crackers, mac 'n cheese, hot dogs, and rice. Your least favorite foods are all vegetables (except potatoes) and all fruits (except bananas), so mostly I try to sneak those in elsewhere. Juliana likes to hide behind the water machine. She also things the big bag of rice (beneath her) makes a great seat. Playing: You love to play hide and seek, chase (with your doll stroller and riding train), and ring around the rosy. 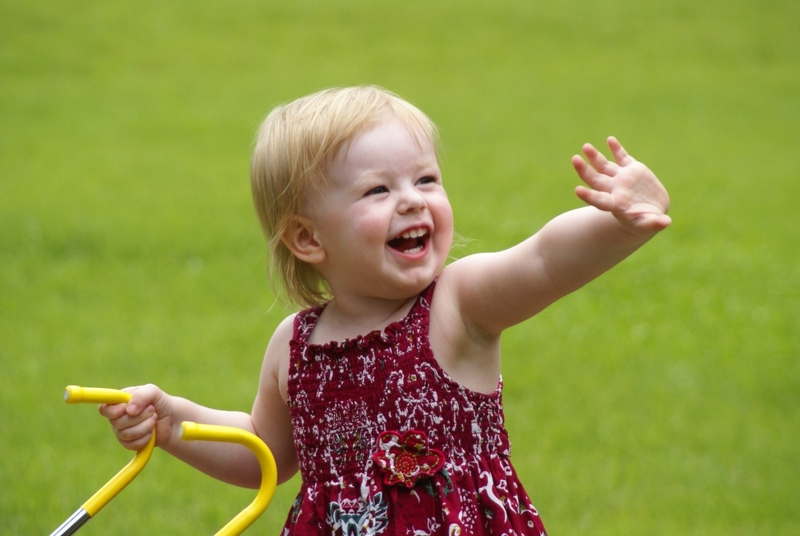 You love to play with Little People (especially the baby), dig in the dirt, draw pictures (markers or messy paint prefered) and do almost anything as long as it's outside. You have started to play for longer periods (sometimes 20-30 minutes) on your own, though usually with mama or daddy nearby. Every week we have a play date with your other foreign friends in a home or at the park, and every day you see your little Chinese friends outside. You have lots of fun. Other favorites: You love to read and are developing a longer attention span. You love your Pete the Cat books and can repeat parts of them. You also love books with songs, like Jesus Loves Me, The Wheels on the Bus, and If You're Happy and You Know It. You love to sing and approximate the words to a number of children's songs. You still love to listen to music and dance along. You are excited to talk to your grandparents and family on Skype. This summer you loved playing with kitchen toys at Grandpa and Yaya's house, so for your birthday we made a play kitchen out of a large diaper box. I hope you will enjoy it and play with it while mama is cooking. 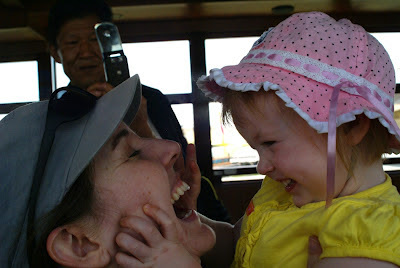 Sometimes life with such an energetic toddler is tiring, but it is also lots of fun. You make our lives very happy. I am looking forward to watching you grow in this next year. Today I got my haircut for the first time in China. It's funny that I have lived in China for six years and never had my haircut here, but most of the time I've had long hair, so I hardly ever cut it. Most years I cut it once in Thailand (an inexpensive salon where they gave great hairwash/head massages, spoke a bit of English, and then finished off with some really good tea) and once in America (either by my mom or in a salon if I was donating - free haircut!). My first few years in China I was afraid of hair salons anyway. I had no ability to communicate what I wanted in a hairstyle, and I had seen that popular Chinese hairstyles were not exactly (or at all) what I had in mind. Short and poofy on the top with a few long strands at the base of the neck was very fashionable at the time. Now that I have a short haircut I actually need to maintain it a little more. After just 7-8 weeks, it was already starting to look shaggy. I know several foreigners who go to a hair salon not far away, but I decided to try out the little hair salon at the bottom of our stairs. For one reason, it takes about 1.5 minutes to get there. For another reason, we know the girls in the salon. Juliana often hears the loud dance music they like to play as we walk past and wants to go inside. The girls are always happy to see her and her dance moves. Walking outside our building last spring. The hair salon is in the background, a converted apartment. Toward the beginning of last year my tutor and I went to chat with the girls as part of a tutor activity. I found out the two girls working there at the time were sisters. The youngest was 16 and had just come to start working. I don't remember everything they told us about their family, but I know it included several more siblings. I think they were from a relatively rural area in another province, so they were probably glad for the opportunity to come work in the city. I immediately liked the girls because they were so friendly, especially the younger one. 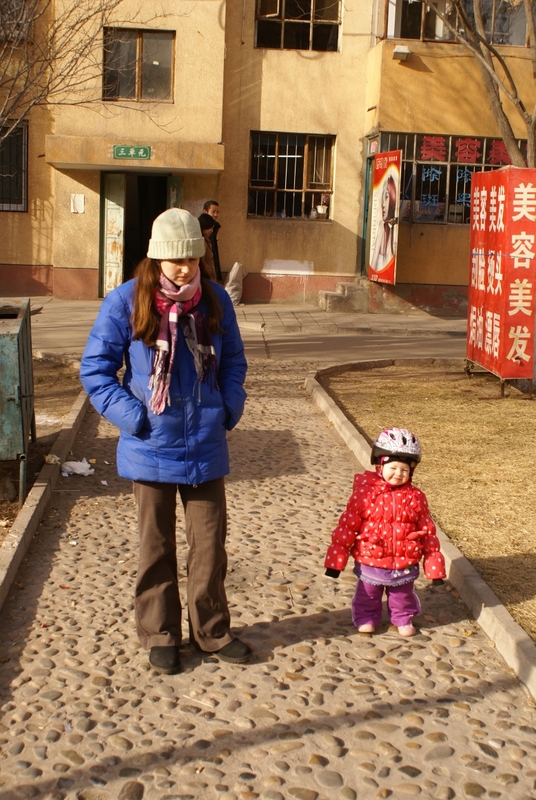 She laughed at my stumbling Chinese but spoke very slowly so I could understand what she was saying. She had a "fresh from the country" innocent, excited sort of look and a ready smile. In the past year, she has adapted more to city life - gotten a cooler hairstyle and been through several dyes, bought a new wardrobe of fashionable clothes, and of course aquired a fancy cell phone. She doesn't look quite so young and innocent, but she is still very friendly and usually looks happy. So today I headed downstairs for my first haircut. We had just been learning different words related to hair and hairstyles in class and tutor time, so I was prepared. Mostly I didn't use them, but I also didn't accidentally end up with a perm or a dye or anything. I told her I wanted it to look about the same as my current hairstyle, just cut a little bit and held up fingers to show about 1/2". Inside the hair salon last fall, pretending to cut my tutor's hair for a photo scavenger hunt. First she washed my hair and massaged my scalp for a bit, always the best part, then she led me over to the chair. The salon had similar equipment as an American salon except it was very small and a good deal more dingy. Pictures of various popular hairstyles were strung from the ceilings and lined the walls. An old couch and a couple of folding chairs served as a waiting area. 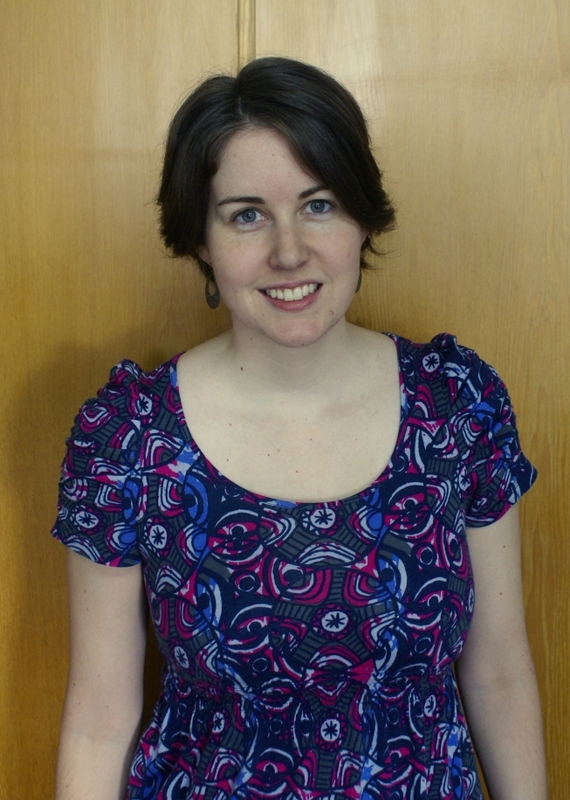 The haircut ended up being about 2" shorter than I had planned, definitely shorter than my summer haircut! She used thinning shears on the whole thing, since a feathery look is popular. My hairstylist this summer used a lot of feathering as well, though. After a quick run through with the hairdryer she was done. I tried to pay but realized I didn't have small enough change for my $1.50 haircut, so I ran upstairs to get a 10Y bill, again appreciating the convenience factor. 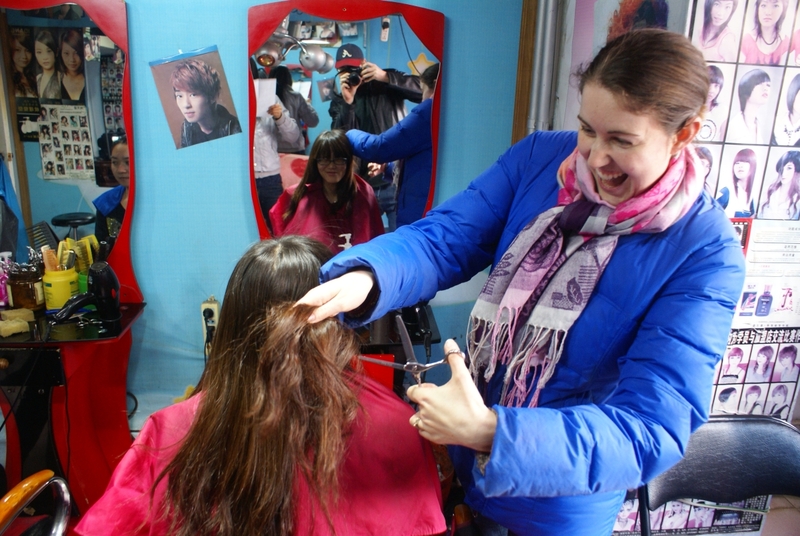 (My tutor said the average price for a haircut ranges from 10-50 yuan, so mine was definitely a bargain. They may have given a slightly lower price since they know me). It's definitely short but I like it, and it may turn out to be even easier to take care of than before! And the price is really hard to beat! I came back home and Juliana actually sat still for about 30 seconds while I gave her a haircut too! No layers, thinning shears, or fancy stuff, but I think it's mostly straight. Kevin just took this picture from our window showing the four large apartment buildings under construction across the street. I believe they were just starting construction on two of them last year when we moved in; I think the tallest two weren't yet started. Construction is a daily sight in China no matter where you live; the only surprising thing about this picture is that I only spot one crane! 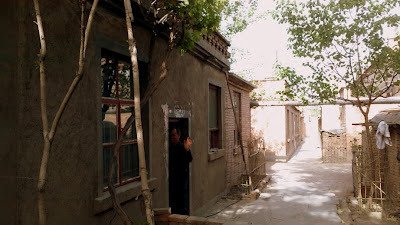 When Kevin picked up food from our favorite Dongbei (Northeastern) restaurant across the street, he said most of these old courtyard homes, like the one we were able to visit last spring, have been torn down. I'm not surprised, since they were so old and increasingly surrounded by high-rises. They weren't so nice inside, but I'm still sad to see them disappear, just as they are all over China. Oh well, you can't live in China long without getting a new neighborhood! 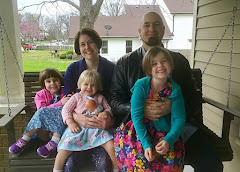 “What kinds of outings work well with not-quite-two-year-olds?” my wife and I wondered. We often bring our daughter to parks or take her to play with friends. And Juliana loves those things. But we figured it was high time for her first visit to one of Southern California's many attractions. Disneyland will undoubtedly be fun, but the price-to-enjoyability-over-other activities-ratio seemed like it wouldn't make it worthwhile for another year or two. She'd probably have just as much fun digging in the sandbox and going on the slide at the local park. Same with just about any other amusement park we conjured up. Our then 20-month-old daughter just isn't old enough to maximize the fun factor. But we knew she loves animals. After all, she had recently entered the phase of life in which she is grabbing hold of every opportunity to name her world, particularly, every giraffe, horse or cat that pops up in her picture books. So when our friends and their three daughters mentioned that they had a San Diego Zoo membership and were planning to make a trip, it didn't take us long to figure out where we should go. The 100-acre zoo was fantastic. It's easy to see why the San Diego Zoo is generally considered one of the best zoos in the world. Although it is home to more than 4,000 animals and 6,500 plant species, the habitats are spacious. The animals are easy to spot and well-cared for. One of the highlights – given our connection to China – were the panda exhibits – one of the few exhibits at the zoo you have to wait in line to see because of their popularity. As we entered the line, I was excited that one year of Chinese studies meant I could actually read the Chinese characters for the panda's names, written at the entrance. Of the zoo's now four Giant Pandas (a baby was born just after we visited in July), we were able to see two: 白云 (Bai Yun or White Cloud) and 高高 (Gao Gao or Tall Tall). Unfortunately, we arrived while Gao Gao's cage was being cleaned, so we had to wait about ten minutes for him to arrive back in his cage. Then we only had a few minutes to snap a few photos before being urged on to make more room for other visitors to get a glimpse of the black-and-white bear as he lazily gnawed on sticks of bamboo. Our daughter also loved other exhibits. She gazed adoringly at the orangutans. She eagerly pointed out the giant elephants. She giggled at how much bigger the giraffes are in person than in her picture books. She smiled as colorful birds whizzed past in the spacious aviaries, then picked up the tropical leaves that had fallen onto the walkway. She particularly enjoyed the polar bear and hippo exhibits, which allow you to look at the animals from multiple vantage points – both below the surface, through a giant aquarium-like window and above it. There's also a small play area which a hippo statue outside the hippo exhibit, which Juliana eagerly explored, popping her head from behind a tree in a game of peekaboo. Previously, every time she saw a bear in a picture book, she called it a dog. On the ride home, she was identifying them correctly, also adding words like “snake,” “rhino,” “panda” and “zebra” to her vocabulary. I can't find much to fault about the San Diego Zoo. One slight negative, however, is that it is a bit tricky to navigate the hilly terrain with a stroller. Thankfully, the zoo has installed moving sidewalks that weave up and down along the hills, making it a breeze to climb them if planned out correctly. The Skyfari aerial tram is also helpful for seeing the polar bears. However, since we couldn't bring strollers on the aerial tram, we didn't explore much further than the zebra exhibit in that section of the park. Families planning a trip to the zoo can save money by purchasing zoo memberships. Members are entitled not only to unlimited entrances to both the zoo and the San Diego Safari Park (formerly known as the Wild Animal Park) for a year, but they also receive a pair of “Super Discount Admission Coupons” to use on guests (which reduce the gate price to $15, making them worth $27 if used on adults or $17 for kids). They also get a subscription to the ZOONEWZ magazine and several other discounts. Through a deal available to California residents, we bought a dual membership, which covers two adults from the same household for $109 (a single membership is $88). Since my parents were also along for the trip, buying the membership was a no-brainer. Regularly, adult tickets are $42 apiece. Children ages 3-11 are $32. Admission for younger kids is free, so when you factor in the discount passes, buying a dual membership is much less expensive if four or more adults are going together. Since four $42 tickets would cost $168 and the total cost of a dual membership plus two $15 “Super Discount Admissions” comes to a grand total of $139, it saves money from the getgo (for two adults and two kids it would actually cost $148 – making it slightly more expensive to buy the membership). And, on top of that, we can go back again for free. Additionally, parking is always free at the zoo. However, a potentially even better deal is on the horizon: Kid's Free Days. In honor of the Zoo's founding, from Oct. 1 through 31, 2012, kids ages 3-11 will get free admission when accompanied by an adult. However, tickets to use the guided bus tour and Skyfari Aerial Tram (which are included with other ticket fees) cost extra. Another way to save a few bucks is to bring your own food and water. Yes, the San Diego Zoo is one of the few amusement parks that actually allows you to bring your own food. And when you're pushing kiddos around in strollers, it's easy to pack meals for the whole family. I sort of shoved her out the door. I had just given our ayi (babysitter) a summer bonus. We would be gone over the summer, but it wasn't her fault we were taking away her work for almost two months. I knew she would reject the money if I gave it outright, so I put it in a red envelope, specially used to hold gift money, hearing that it was impolite to refuse a red envelope. It was the day before we were flying back to America and when ayi came to watch Juliana one last time, I reminded her that we would be leaving tomorrow. Unfortunately, she looked surprised. "You will leave tomorrow??" Hmm, perhaps that communication didn't go through as clearly as we thought. I knew we had better wait until the last minute to give the bonus since every month she argues about the salary. When she started working for us and our teammates in the spring, we set what seemed to be a fair salary, the high end of average for this area (about $2.50/hr). But apparently our children have been such a joy to watch that ayi feels like she is being paid too much. Or something along those lines. Though we give her a flat monthly salary, if she ever misses a day (usually if we are gone or have a holiday), she tries to return part of the salary. It's a very perculiar problem and not quite your usual bargaining! "Take the money! We already agreed on your salary!" "No, it's too much. Pay me less!" In reality, she is already getting paid less because she works much longer hours than we hire her for. Technically she comes to our house 2hrs each weekday afternoon, but she usually arrives about 20 minutes early and leaves 30 or even 45 minutes late. While the weather is good, she takes Juliana outside every day to play. The first time she brought her back at 6:40 instead of 6pm, I was a little worried; now we know to expect it. By the end of the week, instead of the agreed 10 hours she has worked at least 15. She is a pretty private person so we know very little about her homelife other than she has a grown son. Perhaps now that her son is out of the house, she doesn't like being home alone. Her husband must either work long hours or be the one who cooks dinner since she doesn't usually get home until about 7pm (and Chinese people usually don't eat late). At any rate, she is never in any hurry to get home. We are certainly glad to have such a willing helper who loves playing with Juliana and tries to help us out however she can. We wanted to show her the we appreciate her, and we wanted to make sure she would have income to get through the summer. Thus the money in the red envelope. I slipped the envelope in with a cute picture of Juliana (a bit of distraction) and passed it off to ayi just before she left. She thanked me and headed home. Excellent - our plan had worked. Not two minutes later there was a knock on the door. "This is too much money! I can't take this!" It had seemed a little too easy. I assured her that we really wanted to give it to her and this was the point that I more or less shoved her out the door saying, "Take it! Take it!" She left, I felt successful. Of course we did not have the last word. The next morning, as we prepared for our afternoon flight back to America, ayi showed up at our door with large bags full of presents - local specialties, meat, rice cakes and sweet breads for Juliana. Between gifts for us and our teammates, she had spent at least half of her bonus. Foiled again. But now she was very happy. Chinese people generally love giving gifts. It reminds me of Spring Festival when we gave our last ayi a holiday bonus and ended up with a large, expensive toy car (except this time our ayi was happily able to continue working for us). Sometimes you just can't win. Sometimes the best gift you can give is to graciously receive someone else's generosity. Which is why tomorrow, despite our protests, ayi is bringing us a roasted duck.